Jura 10 year old – I won this as part of the Jura website’s weekly pub quiz. I’ve knocked back a fair bit of Jura in my time, but don’t think I’d ever tried the regular 10 year old. On the nose it had caramel, a hint of wet peat smoke, vanilla, apples, floor polish and an underlying meatiness (chicken?). To taste there was toast, sweet wood, pine, vanilla cream, pepper, rhubarb and lime skin, wrapped up with a dry wood finish. Water added more vanilla, more sour wood, more woody spice and white pepper on the finish. 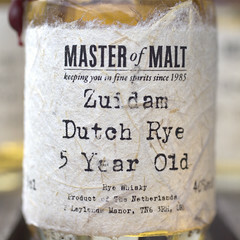 Zuidam 5 Year Old Dutch Rye – I grabbed this in my first batch of drams and it sat around for a while before I got round to trying it. Zuidam are a Dutch distiller who started in 1975 and they make genever, gin and liqueurs along with their whisky. This is a whisky made predominantly with rye, unlike Scotch’s barley and bourbon’s corn, and from my experience of US rye I was expecting something spicier than a bourbon.On the nose it was very bourbony, with some sweet spicy pear underneath and a floral note on top. To taste it started very sweet, with more pears, squishy sultanas and oats. Water expanded the vanilla sweetness, bringing out milk chocolate, sweet wood and more sultanas – maybe a touch of rum and raisin fudge? It can take a good slug of water and calms to a very sweet dram. Campbeltown Loch 30 Year Old – regular Campbeltown Loch is an inexpensive blended whisky put together by J&A, the owners of Springbank. This one is a rather more special bottling, with all the whiskies coming in at at least 30 years old – something that appealed to my Springbank and Longrow loving tastebuds. On the nose it was florally sweet with a sour edge – rose water, turkish delight, linseed oil, sour grapes and the air around a brewery on malting day (beefy maltiness) all made an appearance as well. To taste it had a syrupy sweetness to start (strawberries and apples), quickly disappearing behind a layer of wood caramel and fading to a warm dry woody finish. Water brought out some vanilla sweetness in the beginning, with underlying spicy wood. The finish was bolstered with a chunk of custardy vanilla and raisins. 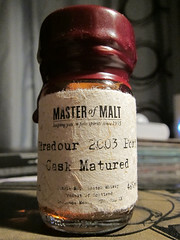 Edradour 2003 Port Cask Matured – I’ve not tried much from Edradour but I quite like their ‘we have the smallest stills in Scotland’ claim, so have been meaning to for a while. I chose this one due to a hole in my whisky tasting knowledge when it comes to port cask finished whisky. The cask had definitely had some of an effect on this, with the whisky sitting rather pink in the glass. On the nose it had candy floss, refreshers, bubblegum and hint of spicy wood. To taste there was linseed oil, sweet wood, sherbet lemons, and a bitter wood finish with sherbet ‘sparkles’. It tasted stronger than its 46%. Water revealed a hint of creamy vanilla on the nose and much more on the taste – pine, light custard, perfumed raisins, foam strawberries, milk chocolate, smoky struck matches and a hint of citrus leading into the still woody finish. Chichibu Double Matured New Born Cask No.446 – Chichibu is one of the newer additions to the rapidly ramping up Japanese whisky industry, opening in 2008. 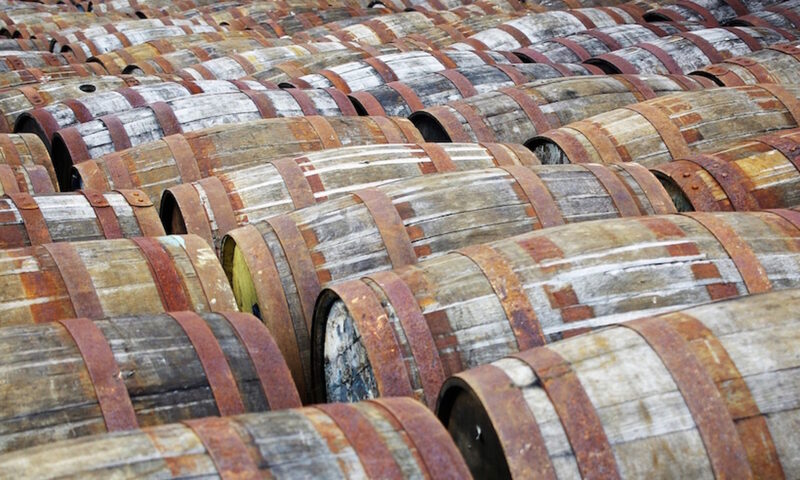 As such none of the spirit produced is quite whisky yet, and this sample was matured for about 2 years, first in a bourbon cask before being moved to a new american oak barrel to finish (hence the Double Matured moniker). On the nose it had pine floor cleaner, lemons, cola bottles, foam shrimps, bananas, creamy vanilla and damp wood. To taste it was very hot, with spicy wood and creme patissier. Water calmed it down (it was bottled at 61.3%) and the woodiness became very perfumed, with lots of sweet fruit down the sides of the tongue (red rope liquorice? ), liquorice root and a fragrant but astringent woody end. Creamy but with a sour edge from the wood. This was very interesting and has added Chichibu to my ‘try whenever possible’ list. Single malt Jura Scotch whisky, 40%. ~£25 from Master of Malt. Dutch rye whiskey, 40%. ~£60 from Master of Malt. Single malt Highland Scotch whisky, 46%. ~£40 from Master of Malt. Blended Scotch whisky, 40%. Out of stock, but was about £45 from Master of Malt. Japanese grain spirit, 61.3%. Out of stock, but was about £60 from Master of Malt. Hiya Billy – I’m new to your blog but am diggin’ your notes quite a lot. Cheers!